But not for further driver training. 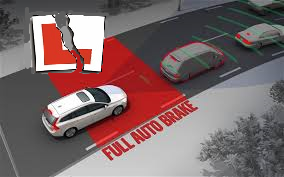 I see that calls have been made for Autonomous Emergency Braking to be fitted to all new cars. It has been suggested that those who choose a car with this technology fitted should be rewarded by having some of the cost covered by a government concession. All very nice. If a person decided to take an advanced driving course to improve their level of competence and minimise risk would they receive a cash incentive? I think not. In a world where it is estimated that three quarters of all UK drivers would fail the standard driving test this reliance on technology can be a dangerous thing. What is Autonomous Emergency Braking anyway? I've been looking at how it works on the make of car I drive. A front mounted radar detects vehicles up to 80 metres ahead which the car may hit unless some action is taken. If the device thinks a collision is likely then an audible warning is given. If the driver doesn't respond then there is a braking jolt to again warn the driver. The brakes are prepared so when the driver does brake then the correct amount of braking pressure is automatically applied. No action from the driver means the device will do the braking on it's own. The autonomous braking only works at low speeds up to 30kph. At 30 to 80kph there are warnings if it detects a stationary object but no braking. At speeds above this there are warnings and some partial braking with brake assist for the driver. It's good for stopping low speed shunts then. The technology has it's limitations though. The object in the road needs a certain degree of radar reflectance or the device won't see it. Also if the sensor is obscured by dirt or snow and doesn't have a clear view then it's effectiveness is seriously reduced. Hardly a foolproof device if all that's needed is heavy spray like you get on motorways to render it ineffective. The device can be switched off with the mode stored on the key fob. If two people are using the car then one person could turn it off without the other one knowing. Presumably there is a warning light to tell you whether it's on or off. Don't get me wrong I'm not against new vehicle technology at all. I'm all for progress. What I am against is drivers who wouldn't pass the L test thinking that new technology excuses them (or me) from our responsibilities as drivers. Improving your driving skills, particularly in regard to hazard awareness and planning would help reduce accidents more than any device can. Especially one that can be rendered ineffective if it rains or your car got dirty. In the event of a collision could the device be blamed for not working properly? Would a driver pay less attention to the road if they think the device will take over for them? The most effective safety device you can get is a well trained driver who is paying attention to the road and anticipating what will happen so that early action can be taken. Let's have some financial incentives for people who wish to make the roads safer by reaching the highest driving standard they are capable of.